The facilities at Historic Banning Mills are great for corporate meetings or corporate retreats. With five meeting venues that vary in size, we have the flexibility to accommodate 6-150 people for your function. We have free wi-fi on site that serves almost everywhere on the property. Historic Banning Mills can help you customize a package to meet your needs and requirements, and can accommodate small-medium groups. This small meeting space can accommodate up to 35 people. It is a 26’ wide x 26’ long meeting space that is ideal for 6-20 guests in a classroom style setup, or 25-35 in a theater-style setup. The room has a country elegant theme with a gas log fireplace and easy access to a skywalk and deck with spectacular views of Snake Creek Gorge, 150 feet below. This medium sized meeting space can accommodate 20-50 people, depending on setup and style. It is 27’ wide x 37’ long and is a private meeting area adjacent to the main lodge. This medium sized meeting space can accommodate 20-35 people. 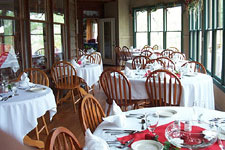 The room is 22’ wide x 36’ long and features a glass enclosed dining area with panoramic views of Snake Creek Gorge. The room can be closed off, which makes it perfect for private meetings or a beautiful, private dining area. This medium sized meeting space can accommodate up to 35 people. The room is 31’ wide x 26’ long and is a private meeting area in the lower level of the main lodge. This meeting room is also home to our small historic interpretive center. It is adjacent to our largest meeting room (McIntosh Room) and is ideal for 20 people in a classroom style setup or 35 people in a theater-style setup. Outside is a covered deck with spectacular views of Snake Creek Gorge. This is a great breakout area for groups who utilize the McIntosh Room. This large meeting room can comfortably accommodate up to 150 people. The spacious 62’ wide x 36’ long room is ideal for 100 people in a classroom setup or 150 people in a theater-style setup. Named after Creek Indian Chief William McIntosh, the room has an elegant country theme and tells the history of the Creek Indians. The meeting space features a large gas log fireplace, and panoramic views of Snake Creek Gorge, 100 feet below. It can open on both sides to outside decks, extending the meeting space (weather permitting). The Hutchenson/Amis Room is adjacent and can be used as a breakout area. 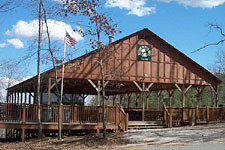 The largest meeting space at Historic Banning Mills can accommodate up to 200 people. It is 50’ wide x 100 long with side areas. The 600’ square-foot covered Grand Pavilion is the largest and most unique outdoor meeting space in all of Georgia. 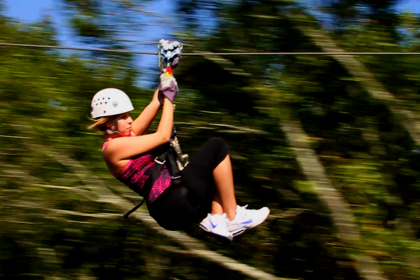 It is built 40 feet above the ground on the high sides and overlooks the Chattahoochee Valley. This space is ideal for large company or group functions. It is equipped with a large rock fire pit, wood benches that convert into picnic tables, lights, power, and stage. Our lovely outside amphitheater can seat up to 200 guests. 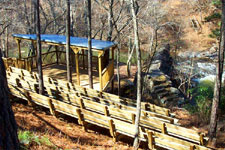 It features a covered platform with a gorgeous backdrop that overlooks the waterfall at the Horseshoe Dam on Snake Creek. This scenic venue is a great space for outdoor lectures or meetings. We are here most every day and welcome you to contact us at 770-834-9149 or send an email, info@historicbanningmills.com when you are ready to plan your weekend getaway, group event, family adventure vacation or corporate retreat. Historic Banning Mills is a non-profit retreat and conservation center. Banning Mills is a non-smoking facility! Please call our Group Sales Division at 770-834-9149 to book your Corporate Event.